How we should learn learn to stop complaining and love the New York Times! How could we not, for it has given us a Chesterton for our times. Who would have believed it? It did not begin this week – but it certainly reached a new level of power this week. The latest shining of this new and welcome light began last Monday with the First Things Erasmus lecture in New York City. Then today we have a penetrating column, a veritable gauntlet for the cause of orthodoxy in the Roman Catholic Church thrown at the feet of its heterodox academic theologians, in one of the free world’s greatest liberal newspapers. We are talking about New York Times columnist Ross Douthat. His star as an interpreter, explainer and sometimes warrior in the culture battles of our time has been rising for a number of years. Since his move to the Times a handful of years ago it has reached super-nova dimensions. Don’t buy the jibe that he is the Times’ token conservative. The Times is a genuinely liberal paper and as such will inevitably give voice to – and at its top level may also sincerely subscribe to – a view of human nature which is wide of an accurate reading of the real nature of the human condition. But its first ideal is to try to give voice to intelligent human beings who are seeking the truth. This it will generally do regardless of what the paper’s own view of the truth at any time might be. The Times may even be as confused as Pilate was about the very possibility of Truth. Its starting point is, however, unarguably a good ideal, one which is at the very heart of our civilization. Because of a commitment to this ideal we can hear the voice of Ross Douthat. This week Douthat gave us a razor-sharp analysis – for me at any rate – of where the “Catholic moment” is today. This was the 28th Annual Erasmus Lecture. It presents a challenge to be sensible, honest and continuously courageous in thinking about where we have been, where we are and where we are going with out Christian civilization yesterday, today and tomorrow. You can watch and listen to this lecture here courtesy of First Things (firstthings.com). Now in its 28th year, the Erasmus Lecture has been bringing world-renowned speakers to New York—including Joseph Cardinal Ratzinger, Archbishop Timothy Dolan, Gilbert Meilaender, and Rabbi Jonathan Sacks—to address an audience of over five hundred people each year. 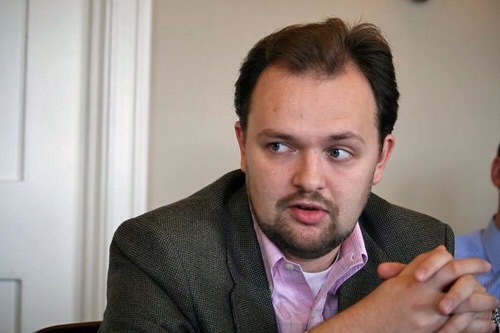 Ross Douthat, who like Chesterton – but without the semantic and rhetorical fun and games – is nothing if not provocative, is the author of Bad Religion: How We Became a Nation of Heretics (Free Press, 2012), Privilege: Harvard and the Education of the Ruling Class (Hyperion, 2005), and the co-author, with Reihan Salam, of Grand New Party: How Republicans Can Win the Working Class and Save the American Dream (Doubleday, 2008). Both his lecture, his column today and on many other occasions, make compelling reading. It is good to have another Chesterton among us.